Amy Robidas is originally from Pennsylvania, but relocated to Maine after serving as an Electronics Technician in the US NAVY. She attended the University of Southern Maine and the University of Maine School of Law. After graduating from law school with honors, she worked as an associate at a firm in Portland, where she practiced exclusively family law and criminal defense. Amy’s practice is 100% litigation and continues to focus on criminal defense and family law, including divorce, parental rights and responsibilities, enforcement of orders, protection from abuse, protection from harassment, and post judgment custody issues. 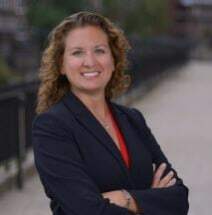 Amy is admitted to practice in both state and federal courts and is a member of the Maine State Bar Association, the Maine Association of Criminal Defense Lawyers, Maine Trial Lawyers Association, and the Edward Gignoux Inn of Court.